For the first time since at least early into the Great Recession, U.S. circulating coin production topped 1.2 billion coins for a month, United States Mint data for January shows. If the pace stretches through to the end of the year, 2013 annual mintages would exceed 14 billion coins. Such a level has not been recorded since 2007. More recently, January coin production at 1,223,680,000 surged 398.8% from December and 52.5% from a year ago. December is often soft as the U.S. Mint changes gears for the coming year. January is typically strong. The following table shows how last month stacks up against others in 2012. Every denomination but the Kennedy half-dollar was minted last month. Lincoln cents led, as they always do, with nearly 675 million, or 55.2% of the entirely monthly total. 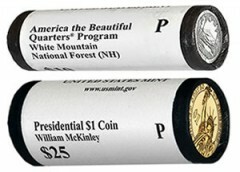 Mintages have yet to be called for the first 2013 America the Beautiful Quarter honoring White Mountain National Forest in New Hampshire or for the first 2012 Presidential $1 Coin depicting William McKinley. The U.S. Mint has been striking them as overall quarter and dollar figures climbed in January. Based on current figures, it appears mintages for the White Mountain quarter will be among the highest of the America the Beautiful Quarters while McKinley $1 coins will stick to similar smaller levels seen for the last year’s dollars. White Mountain quarters launched on Jan. 28, 2013. McKinley Presidential dollars debut on Feb. 19, 2013. For reference, coin production figures for January follow. Kennedy halves, Native American $1 Coins and Presidential $1 Coins are produced for coin collectors. They are not distributed into circulation. Production figures are based on data aggregated from the U.S. Mint webpage at: http://www.usmint.gov/about_the_mint/?action=coin_production.